A promising team, the Minnesota Vikings, took on the defending NFL Champions, the Green Bay Packers, in the second week of the NFL season on September 22, 1968. Both had won their openers comfortably, with the Vikings thrashing the Falcons 47-7 and the Packers defeating the Eagles 30-13. The Vikings, coming off of a 3-8-3 record in Head Coach Bud Grant’s first year, had the makings of a good young defense and there was talent on offense as well, although the passing game was a concern. 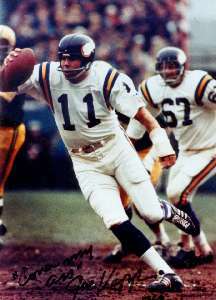 QB Joe Kapp (pictured above) joined Minnesota from the CFL early in ’67 and provided toughness and fiery leadership, if not great throwing talent. QB Gary Cuozzo was obtained from New Orleans at a high price in the offseason to provide another option, but it was Kapp behind center to start the season. It was hoped that one of the second-year wide receivers, Gene Washington or Bob Grim, would step up while the corps of running backs, operating behind a good line, was productive. 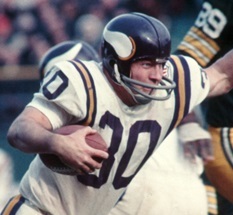 However, the team’s top rusher of 1967, HB Dave Osborn, was out with a knee injury. Green Bay was coming off of three straight NFL Championships and wins in the first two Super Bowls. Head Coach Vince Lombardi had stepped aside in favor of former assistant coach Phil Bengtson, although he stayed on as general manager. Many key veterans, starting with QB Bart Starr, remained and the lineup contained younger talent such as HB Donny Anderson and guard Gale Gillingham, but age and attrition were concerns. There were 49,346 fans on hand at Milwaukee’s County Stadium. The Vikings had the first possession and advanced 67 yards, but after reaching the Green Bay six, a pass by Joe Kapp was tipped by MLB Ray Nitschke and OLB Dave Robinson intercepted it in the end zone. While WR Tom Hall managed to knock the ball loose as he slammed into Robinson, CB Bob Jeter recovered for the Packers. Bart Starr had a 21-yard pass completion to Donny Anderson nullified by a penalty and, the next time he went to the air, FS Paul Krause intercepted to regain possession for the Vikings at the Green Bay 34. Ten plays later, FB Bill Brown (pictured below) ran for a one-yard touchdown and Fred Cox added the extra point. The Packers came up empty on their next series and, following a punt, the Vikings again put together a solid drive of 74 yards in eight plays. Brown again finished the series off with a TD run, this time covering 10 yards, and Cox converted for a 14-0 lead. The Packers, starting from their own 26 after the kickoff, were moved back to the 11 due to an offensive pass interference penalty and then Starr, fading back into his end zone, was tackled by DT Alan Page and DE Jim Marshall for a safety. The score remained 16-0 at the half. The Packers started off the third quarter with an 11-play, 66-yard drive. Starr, under heavy pressure, rolled out and completed a pass to WR Boyd Dowler for 18 yards to the Minnesota 31 and, five plays later, the veteran quarterback got Green Bay on the board by running out of the pocket for a 10-yard touchdown. Jerry Kramer’s extra point attempt hit the right upright and was unsuccessful, but the Packers were now down by just ten points and showing signs of life. A key play came on the next Minnesota series after Bill Brown came up inches short on a third down run to his own 26. The Vikings elected to try and convert on fourth down and Kapp kept the ball himself and plowed into the middle of the line. He was hit by Nitschke, moved to his right, and fought for distance before being stopped standing up. The crowd as well as the Green Bay defense thought Kapp had been stopped short, but a measurement showed that he got the first down by the barest of margins. Seven plays later, HB Clint Jones ran four yards for a touchdown and Cox again converted to put the visitors up by 23-6. It proved to be the clinching series of the game for Minnesota. With the defense keeping the Packers in check and the offense controlling the ball, the Vikings added to the margin before the period was over when Cox kicked a 29-yard field goal. 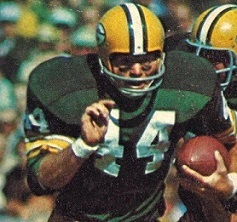 Green Bay was able to score a late, meaningless touchdown in the fourth quarter as Starr connected with Dale from seven yards out, and Kramer added the point after. Minnesota won by a final score of 26-13. The teams were even at 242 yards apiece in total yards with the Vikings holding the edge in first downs (20 to 18). The Packers turned the ball over twice, to one suffered by Minnesota, and were penalized eight times at a cost of 90 yards, typically at critical times, while the Vikings were flagged four times. Joe Kapp didn’t go to the air often, completing 9 of 15 passes for 138 yards and no touchdowns while giving up an interception. Bill Brown rushed for 74 yards on 17 carries that included two TDs while FB Jim Lindsey contributed 33 yards on 11 attempts. WR Gene Washington topped the Minnesota receivers with three catches for 67 yards. For the Packers, Bart Starr was successful on 14 of 22 throws for 148 yards and a TD while being intercepted twice. Donny Anderson (pictured above) ran for 37 yards on 9 carries and caught three passes for 24 yards. Carroll Dale had 5 catches for 48 yards and a touchdown. The game marked something of a passing of the torch between the Central Division rivals. Green Bay, which had won five NFL titles under Vince Lombardi and finished no lower than second place in any of the preceding eight seasons (which meant the entire Western Conference prior to the introduction of the divisions in 1967), struggled to a 6-7-1 record that placed third in the division. The Vikings, who swept the season series with the Packers, initially had problems as well but won five of their last seven games to go 8-6 and capture the franchise’s first division title ever. Minnesota went on to dominate the Central Division over the next decade, and while Green Bay had a postseason appearance in 1972, the Packers endured seven losing records during the same time span.